Brain damage such as stroke is a devastating neurological condition that may severely compromise patient quality of life. No effective medication-mediated intervention to accelerate rehabilitation has been established. We found that a small compound, edonerpic maleate, facilitated experience-driven synaptic glutamate AMPA (α-amino-3-hydroxy-5-methyl-4-isoxazole-propionic-acid) receptor delivery and resulted in the acceleration of motor function recovery after motor cortex cryoinjury in mice in a training-dependent manner through cortical reorganization. Edonerpic bound to collapsin-response-mediator-protein 2 (CRMP2) and failed to augment recovery in CRMP2-deficient mice. Edonerpic maleate enhanced motor function recovery from internal capsule hemorrhage in nonhuman primates. 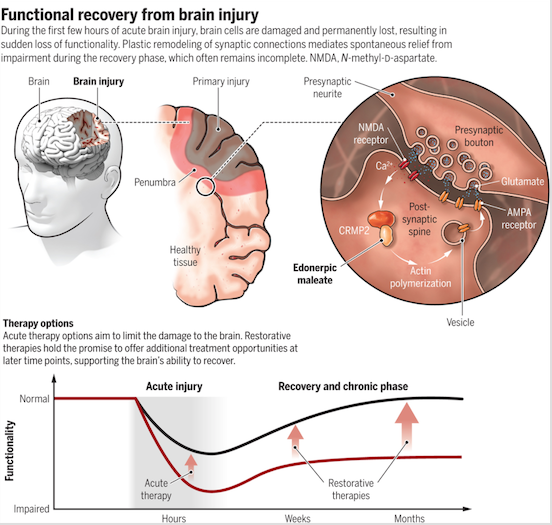 Thus, edonerpic maleate, a neural plasticity enhancer, could be a clinically potent small compound with which to accelerate rehabilitation after brain damage.